“El pibe de Oro” (The golden boy), Diego Maradona is arguably not the best player of all time but no one can deny that he was the best player of his generation. He proved his extraordinary abilities during the World Cup in 1986 by leading a generally unimpressive Argentina to the world title and then to the final in 1990. 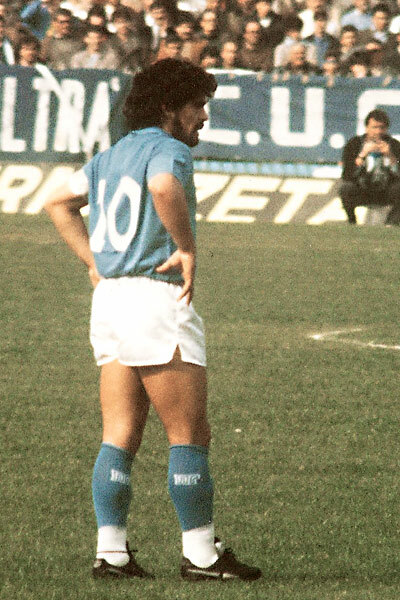 Napoli also owes much to Maradona – he led the team to two national titles (1986-87 and 1989-90) and the UEFA Cup (1988-89). Maradona set the world record transfer fee twice. As a mark of recognition for services rendered to the club Napoli retired the Number 10 shirt in 2000. Despite being only 27, Lionel Messi is already in the top 5. As long as he continues playing for his country and racking up the trophies and honours, he stands a good chance of topping a future edition of the 11v11 World Player Ranking. For some, Messi is the best player in football history. It is true that “La Pulga” (“the Flea”) accumulates records with no less than 125 records broken or tied in 2013 including four Ballon d’Or won in a row (2009, 2010, 2011 and 2012), three European Golden Shoes (2010, 2012 and 2013), number of goals scored in a championship (50 in 2011-12) and sole author of five goals in a game in the Champions League. It is his vision of the game and his footballing genius which differentiates Messi. He is able to do things that other players cannot do, partly thanks to a lower centre of gravity.